Attribuzione: base prepared in the Office of the Surveyor, D.C., by direction of the Engineer Commissioner, D.C.
Formato: 1 map : col. ; 77 x 85 cm. 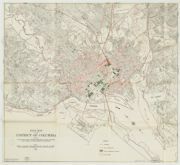 Note: Also shows block numbers and proposed streets.Base map "Complete to June 13, 1933. "Oriented with north toward the upper left. "S O 82153." Available also as a digital image through the Harvard University Web site.